In addition, the Pebble Smartwatch also includes a 3-axis accelerometer that allows it to function as a pedometer. Since the Pebble has been well-publicized from its origins as a Kickstarter-funded project, the big news out of CES was that the product release date was finalized, and Kickstarter backers will be receiving their shipments by the end of the month. Journalists also got to go hands-on with the Pebble smartwatch, and the overall consensus seems to be that the watch is going to impress. Unfortunately, details about how the Pebble will function as a running tracker or activity tracker have been extremely limited, but Runkeeper has announced that they plan to integrate compatibility with the Pebble. My hunch is that the Pebble will function as an external display for the Runkeeper app, and not so much like a full-fledged activity tracker like the Fitbit or FuelBand. The Variable Tech NODE is a system of sensors that attach to a base cylinder, called the KORE. The KORE features a rechargeable battery, low-energy Bluetooth 4.0, gyroscope, accelerometer, and magnetometer that allows it to function as an activity tracker or input device at the very least, not unlike a Wii Remote. Then, you can attach up to two interchangeable modules that add additional sensors. The current modules available include the CHROMA for identifying colors, the THERMA for using infrared to measure surface temperature, the CLIMA for measuring barometric pressure, elevation, ambient light, temperature, and humidity, the LUMA for adding a flashlight, and the OXA for detecting ambient levels of CO.
Our friends at medGadget were able to interview the founder and CEO of Variable Tech, George Yu. 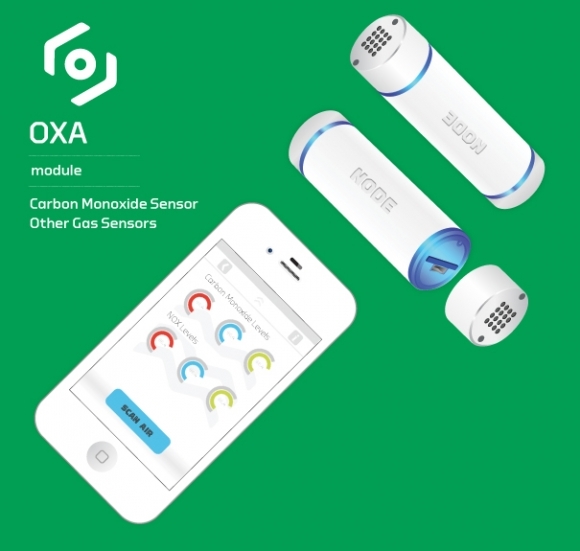 During the video interview, he describes medical applications of the NODE, including the CHROMA for comparing skin tones in jaundice, the THERMA for measuring temperature, and the OXA for carbon monoxide measuring. While somewhat of a niche product at this point, the modular utility of the NODE, and its parts, show a lot of promise for assisting with medical care in third world countries or medical mission trips. It’s also exciting to see that Mr. Yu plans on further fleshing out the NODE for more medical uses. As a doctor, the technology sector’s current fascination with mobile health peripherals is somewhat intriguing to me. I am convinced that obesity and physical inactivity are significant burdens on our society and financial costs of health care. It seems that many believe that health technology might be able to provide a solution, with activity trackers and data collection gadgets. What are your thoughts? Will this fad soon fade, like others in the world of consumer electronics (like 3D televisions and netbooks)? Or are their other areas in mobile health that are being overlooked? I think some of these devices are excellent- Dexcom’s use of consumer-orientated interface, and technologies is excellent, though I’m yet to hear about the technical aspects of the device. HRM, CGM, actigraphy, two-lead EEG, wifi weigh scales, and camera phones are all excellent tools for the patient-doctor team in my experience. Greater use of wifi and bluetooth LP (rather than Ant+) are also a boon, as these easily work with iPhone/iPad, Samsung Galaxy/Note etc. My only complaint is that some of these companies don’t seem to be talking with consumers and practitioners.